We are sufficiently concerned at the problems with a large percentage of the dogs that we deal with that can be linked to a certain type of pet food that we have been prompted to write this page. One particular brand alone appears to be responsible for in excess of 80% of our behavioural cases and it is interesting that when the diet is changed to a more natural product in most cases the behaviour is modified, sometimes eliminated altogether. Chemicals are added to food to change its colour, preserve it, prevent rancidity, keep fats emulsified, and foods stable, giving it a longer shelf life. Most of the chemicals are synthetic compounds, many with known negative health effects. But more importantly, we don’t really know what the long-term consequences of consuming such large amounts of additives are. E-numbers are food additives approved for use in the European Union. The fact that they are “approved”, does not mean that all those substances are safe – especially not in chronically high doses. These chemicals are used to disguise the poor quality of the raw materials that constitute the nutritional component of these products. 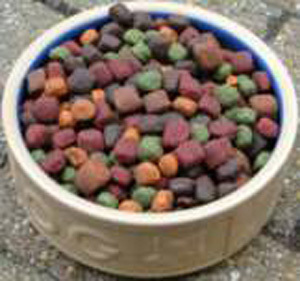 The colour dyes are added to appeal to the human owner, whilst we know that dogs’ perception of colour is minimal. It is designed to appeal to humans, with its cute little bone shaped biscuits (fed to dogs that have probably never even seen a bone). It goes without saying that some dogs, as with humans, appear to have a cast iron constitution and tolerate the ill effects of synthetic chemicals more easily than others, at least for a limited time. However, would you want to run the cumulative risks presented by ingestion of additives with known ill consequences? Three years ago I wrote to the manufacturer of the food shown giving them our data and expressing our concern. We thought they would be interested but disappointingly I received a ‘one liner’ dismissive reply showing no interest whatever in our findings. We publish a list below of ‘E’ numbers, all used in this product and others like it together with other questionable ingredients, and invite you to ask yourself whether you would want to be feeding it to your dog. 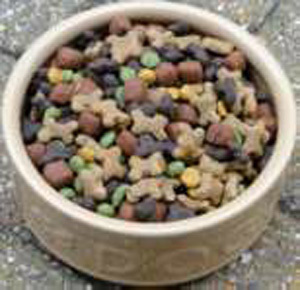 At the bottom of the page we have included a list of the foods that we prefer to feed the dogs coming to us, healthy alternatives which you may like to consider. As a solvent in many pharmaceuticals, including oral, injectable and topical formulations (notably, diazepam, which is insoluble in water, uses propylene glycol as its solvent in its clinical, injectable form. Propylene glycol is used to control moisture content and as a solvent for food colouring. Some moist foods and those with lots of dyes contain propylene glycol. Used in the beverage mixer Sweet N Sour. Used in antifreeze because it can act as a coolant. Can cause severe allergic reactions (rash; hives; itching; difficulty breathing; tightness in the chest; swelling of the mouth, face, lips, or tongue). In large amounts, it can increase body acidity and produce toxicity. To avoid it, stay away from foods with lots of dyes. Not only are the dyes dangerous, but the chemicals used to put the dyes in the food are harmful as well. Titanium dioxide is added to paints, cements, windows, tiles, or other products for its sterilizing, deodorizing and anti-fouling properties. In cosmetic and skin care products, titanium dioxide is used as a pigment, sunscreen and a thickener. It is also used as a tattoo pigment and in styptic pencils. Titanium dioxide is used to mark the white lines of some tennis courts. May cause allergic reactions of the skin (itching, red spots). E171 is an additive that can be hard for the body to break down so can be found in the lymph system. The International Agency for Research on Cancer says BHA is possibly carcinogenic to humans. BHA also interacts with nitrites to form chemicals known to cause changes in the DNA of cells. Believed to cause allergic reactions ranging from Hyperactivity to asthma, migraines, rashes and digestive upset. BHT is also documented as an antioxidant additive in such diverse products as cosmetics, pharmaceuticals, rubber, electrical transformer oil and embalming fluid. In the 1970s, it was claimed that BHT could produce hyperactivity in children. In addition, some controversy surrounds the link of BHT to cancer risk, Some food industries have voluntarily eliminated this additive from their products, Some foods labelled as “no preservatives” or “no preservatives added” actually contain BHT that was present in the ingredients used to make the product but which do not need to be declared on the label. Some European and Asian countries have severely restricted the use of BHA and BHT as food additives or banned them altogether. The following food colourants have been shown to increase hyperactivity in children. Has been found by some studies to cause nausea, vomiting, high blood pressure, breathing difficulties and skin irritation. It is banned in Norway. A synthetic red azo dye used in foods which must be heat treated after fermentation. It appears to cause allergic and/or intolerance reactions. Other reactions can include a rash similar to nettle rash and water retention. The Hyperactive Children’s Support Group believe that a link exists between this additive and hyperactive behavioural disorders in children including ADHD. The symptoms suffered range from rashes and skin reactions, to bronchial and breathing problems, headaches, digestive problems, nausea and hyperactivity. The hyperactivity is particularly prone in children and has been linked to a range of colours widely used in products such as drinks. A food colourant which has been reported to cause genotoxicity, dermatitis, urticaria and rhinitis. The colour additive can also increase the intake of aluminium beyond the tolerable weekly intake, showing an effect on intelligence. Tartrazine is a synthetic yellow azo dye derived from coal tar and has been banned in several countries including Austria & Norway because of serious side effects such as causing potentially lethal asthma attacks and nettle rash, hives, DNA damage, tumours of the thyroid and ADHD. Other dangers of Tartrazine are anxiety attacks, itching, rhinitis, urticaria, general weakness, heatwaves, migraine, clinical depression, blurred vision, palpitations, feeling of suffocation, pruritus, purple skin patches and sleep disturbance. Studies done on animals have suggested that it could be linked to cancer, so it is an additive to be concerned about. Other side effect of consumption is stomach and skin irritability, as well as allergic reactions that impact breathing. It may also cause kidney and liver problems. Derivatives of Vegetable Origin – a term used on a lot of pet food labels. Used to describe all manner of vegetable by products from any vegetable, cereal, legume and/or oil seed. No particular vegetable is specified as this will allow manufacturers to use the cheapest available at the time. Cheap protein sources such as soya are also often used instead of meat in many pet foods. They are hard to digest and much less suitable than real meat protein. Because it is impossible to know what ‘derivatives of vegetable origin’ refers to, it is usually best to assume the worst and treat it with caution. This is particularly important if your dog is prone to dietary intolerance as identifying and eliminating problem ingredients is impossible unless you know exactly what you are feeding. The main problem is the fact that it doesn’t specify what type of meat it contains, allowing pet food manufacturers to use any part of any animal to make their food. Meat by products are generally obtained from the most undesirable parts of the animal such as head, feet, guts and are lacking in nutrition. Like other vague terms, ‘cereals’ does not define exactly what is in the food – it could be wheat, barley, oats, maize or other cereals. There is no way of knowing which are being used, and as some cereals are healthier than others, and others can cause intolerances and allergies; knowing which are being used in your pet’s food is very important. 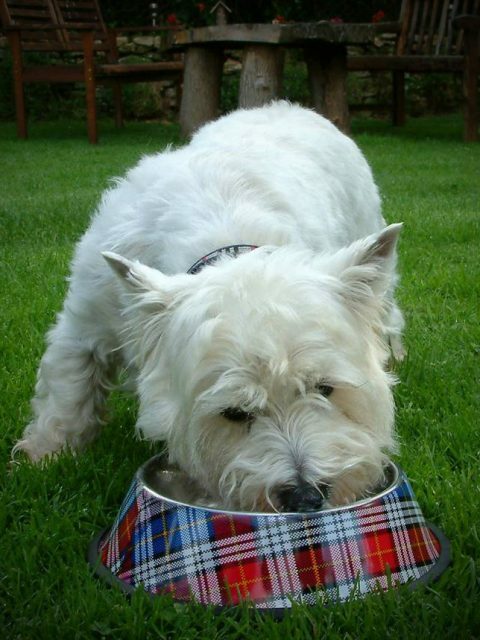 Wheat for example is high on the list of allergens for westies as well as other breeds, and it is generally wise to avoid a wheat based diet.